Before I tell you about our adventure with Motor Man’s mom this weekend, I have an announcement to make. Since my husband is “Motor Man” and I am “Motor Mommy”, I thought it only fitting that we have a blog name for his mother. We discussed it Sunday, and decided that she will be referred to in the future on These Days as “Motor Mum” (as in the Queen Mum). After lunch Sunday, we headed to North Carolina in search of Knott’s Island to take Motor Mum on the Currituck Sound Ferry. Motor Man had a good idea of how to get to the general area. A few years ago, he and I had ridden the ferry. Well, to put it mildly, we had a little difficulty finding the ferry dock. We saw some interesting sights along the way: beautiful homes, yards and flowers, and some not-so-beautiful homes and yards. It soon became apparent to Motor Mum that her hosts for this trip had no clue where they were going. And it was then that I said to her: “We operate the ‘Fly By The Seat Of Your Pants Travel Agency’, and you take your chances when you travel with us”. I had hopes of the three of us getting out of the vehicle while on the ferry and enjoying the view as we sailed across the Sound. But, that was not to be. The boat is very small, and we were parked so close to the side that we couldn’t get the passenger-side doors open (a little concerning, since it was a 45-minute ferry ride). 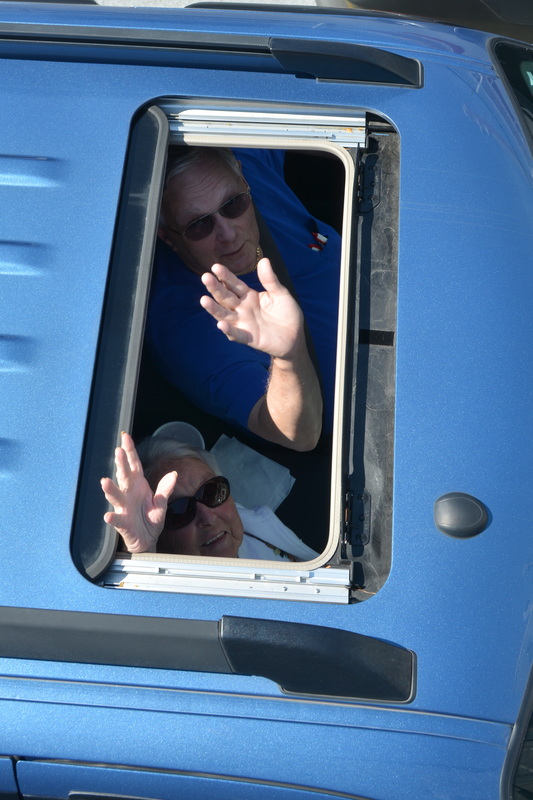 I went to the upper deck of the ferry, and took this picture of Motor Man and Motor Mum, waving at me through the sun roof. We spotted an osprey nest, built on one of the pilings near the dock, and I was able to zoom in for this picture. I love that they’ve used a little green in their decor. Another Sunday adventure, brought to you by the “Fly By The Seat Of Your Pants” travel agency. Suggestions are being taken for a catchy slogan for our newly formed company. 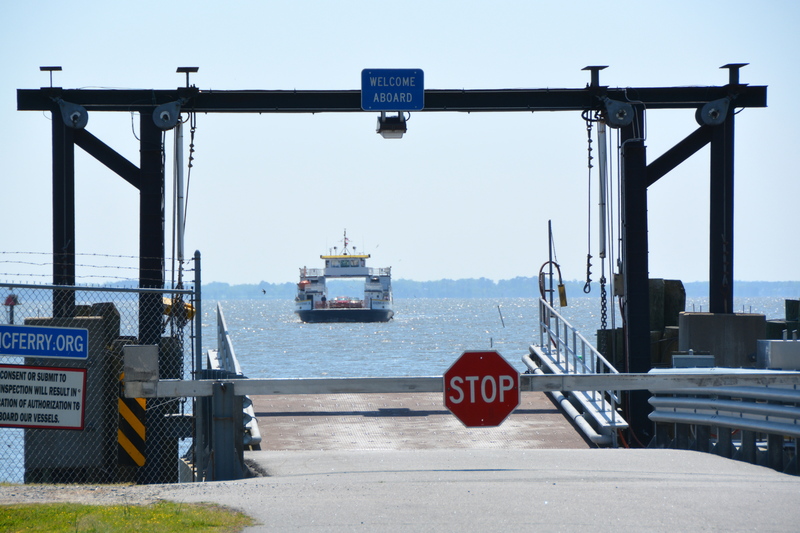 This entry was posted in Family, Traveling Days and tagged currituck sound ferry, knotts island ferry. Bookmark the permalink. At least you all had fun!!! What a delightful field trip and perfect name for the mother of your prince. I love the photo of Motor Man and Mum waving through the sunroof! What a gorgeous day! Before GPS, we used to call our little road trips “Wild Goose Chase Travels.” “Motor Mum” is perfect. They are always the very best journeys. We have them sometimes even now with GPS. Motor Mum is a great pseudonym. But more importantly, what does the Motor Mum think of it? My sister-in-law lives in Myrtle, so I know how confused one can become in that area. You can see the Currituck Lighthouse from her house, but you can’t get there. Lots of history and old homes, but why would anyone want to live way out in the boonies ? Hope your venture was less stressful with all the scenery. The perfect trip for a perfect day. LOL! I would travel with your agency any time, and I can tell that “MotorMum” is delighted at her fly-by-the -seat-of-your-pants adventures. You have been having some wonderful Sundays!!!! Love the travel agency name – very fitting! And Motor Mum – I know she appreciates it. Looks like yet another fun-filled day ! “Motor Mum” …. perfect !! I love going on adventures like that! I’ll go with the “Fly by the Seat of Your Pants” travel couple anytime! I already had one great experience with them! I love ferries. We use them a lot to cross Lake Champlain, between upstate New York and Vermont, and I never get sick of them. But it is sad that you all couldn’t get out of the car! “Motor Mum” is a wonderful title! I am sure Motor Mum enjoyed the ferry ride. They never grow old. 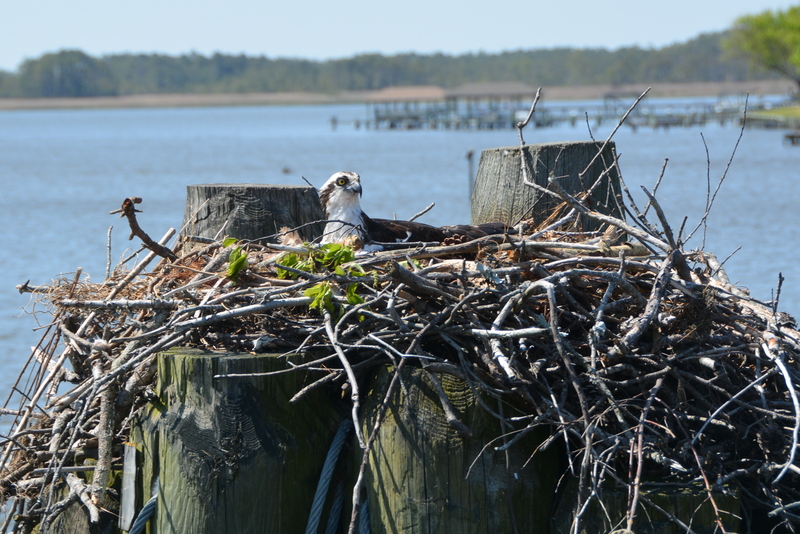 Nice photo of the osprey nest–Osprey’s are such impressive birds. Love the name of your travel agency. Motor Mum is a good name, too. We’ve been to the dock, but never took the ferry. It’s a nice ride out there. Motor Mum looks like she’s having fun!! Good choice of names and since Motor Mum obviously agreed it will stick just fine. As for the newly named travel agency, I like the proposed name. We never did come up with a suitable name for our own road trips, other than called them mystery rides, especially when we had no specific destination in mind. Sounds like you had a great adventure and I like Motor Mum, it’s a fitting name. Loved the Osprey nest. Motor Mum is perfect. I know she is treasuring every special memory you all are making together.